Intricately woven towers, with the podium resembling a handcrafted carpet, will be a reality in the UAE. Al Qudra Real Estate, the real estate arm of Al Qudra Holding, is planning to launch a five tower residential project in Al Reem Island, Abu Dhabi. The Al Sadu Towers will be a high-end luxury towers, offering 1,300 residential units. A company official refused to comment at recently-held Cityscape Abu Dhabi 2016. 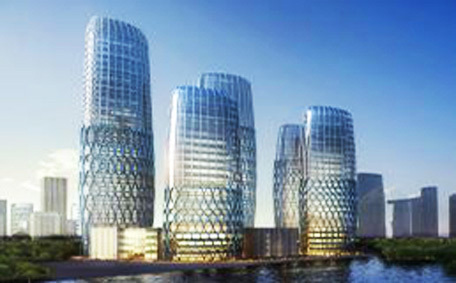 The concept design of five towers, spread over 17,532 square metres, is inspired by one of the oldest traditional forms of weaving practiced by Emariti women in rural communities which is listed in Unesco intangible cultural heritage. “The vertical lines interlocking with horizontal lines envelop the five towers, replicating the Sadu movement and the various stages of carpet making. The Sadu meshwork wraps itself around the entire structure of the towers and podium presenting a sophisticated vail,” a company brochure states. Though no official date of the launch has been given, an informed source said it was likely to be before year-end. No details on the project cost and tender timeline was given. According to Al Qudra website, it is currently developing several self-contained and sustainable residential and commercial communities in Abu Dhabi and Al Ain. Major projects include Ain Al Fayda Emariti Housing (2,000 villas), Ain Al Fayda Commercial Villa (518 villas), and Ain Al Fayda Lakes, a villa development, in Al Ain and Danet Abu Dhabi, a mixed-use community in Abu Dhabi. In June 2015, Abu Dhabi Urban Planning Council had announced the new master plan for Al Reem Island, which covers a total land area of 8.869 million square metres and will house 210,000 residents on completion. Almost 101 projects and master plans received detailed approvals by the UPC during 2015 compared to 65 projects and master plans approved in 2014. These approvals include 27 projects that received the go-ahead in the final quarter 2015, two of them in Al Ain, 21 in Abu Dhabi City and four in Al Gharbia (Western Region).